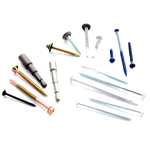 This single operation fastener eliminates the need for drilling and tapping seperately. This fastener drills, taps, and fixes in one operation. Bright zinc plated FORGED point drill screw for hot rolled rails and purlins. Designed to eliminate the inherrent problems of milled point fasteners such as skidding, slow drill speeds or burning out before material is properly drilled. Available in either hexagon head for steel to steel applications or countersunk "winged" for fixing timer to steel. 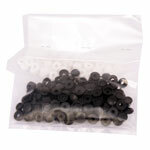 Bonded insulation washers are also available to prevent either leaking or corrosion between disimilar metals. 3pt screws are coarse threaded for thinner base materials and 5pt screws have fine self cutting threads to avoid cross threading in thicker materials. N.B. Maximum fixing thickness = Thread length minus the thickness of the base material. For further information on Pierce Plus Screws or any other product, contact our friendly sales team on 0121 544 0055. To buy Pierce Plus Screws select the quantity required from the table below.